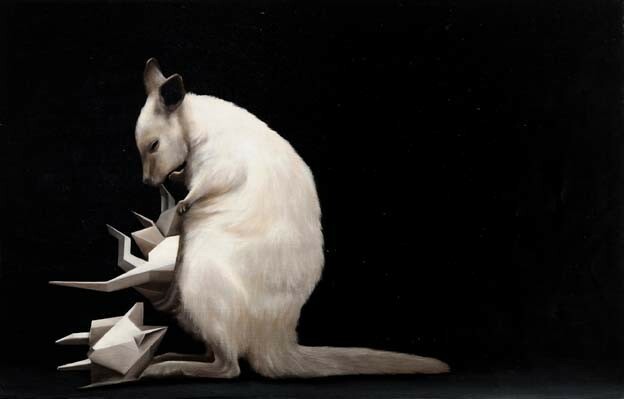 Sam Leach, 'Wallabies', 2010, oil and resin on linen and ebony, 20cm x 30cm. Courtesy: Sullivan+Strumpf Fine Art. Artist’s statements are a funny old business. People who may ordinarily be quite good communicators suddenly develop a penchant for labyrinthine writing styles and grandiose phrases. They start referencing philosophers, French theorists and assorted scientists, feeling that this lends the work (and by proxy themselves) a gravitas they clearly think is lacking on its own. None of us are completely immune to this syndrome. The statements I’ve written for my own work all seemed fine at the time. Most became totally cringe-worthy later. At best artist’s statements are extraneous. They can add a few personal details or a bit of background info that couldn’t be gleaned from the work; unnecessary, but (hopefully) interesting. At worst, they can be distracting, confusing and pompous. Most art is best served by the artist learning to keep quiet. With this in mind, I rarely read artist’s statements. I prefer to interpret the work for myself. I’m not sure why, but for some reason I did read Sam Leach’s statement for his solo show Present at Hand. In just over 350 words he cites not one, but four learned gents: Martin Heidegger, Graham Harman, Bruno Latour and Mark Fisher (who neither I, nor Wikipedia, are familiar with) and he talks a lot about theories relating to objects. Now Leach’s paintings are of animals, so I was initially a bit confused. Surely animals, as sentient beings, are subjects, not objects?? But then, on the third re-read of this part, “In Latour’s Actor-Network Theory humans and non-humans (technology, animals, plants, social and corporate entities) have agency, or the (ability) to act within networks. But objects have a reality that is irreducible to their relations. A painting may derive its meaning through relations to a viewer, but it is still irreducibly an object,” I decided that Leach is revealing an obsession with the nature of his paintings as things. 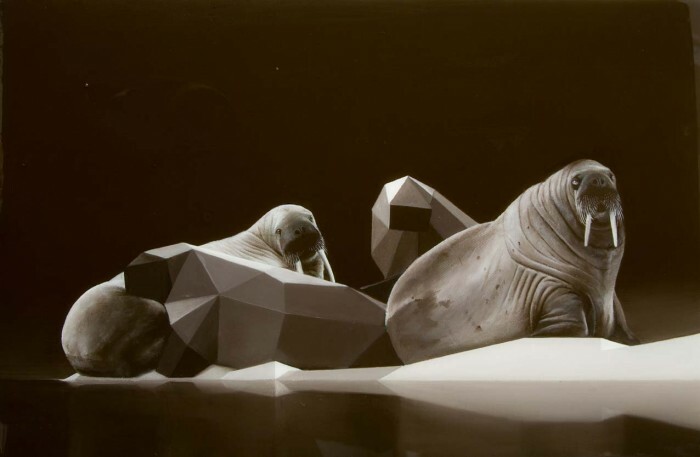 Sam Leach, 'A pair of vicarious walrus', 2010, oil and resin on linen and wood, 30cm x 45cm. Courtesy: Sullivan+Strumpf Fine Art. In this exhibition, Leach seems particularly anxious to highlight the artifice of his work. He does this by deliberately messing with his own hyper-real style. Many of his animals are shadowed by cubist versions of themselves, like not fully rendered CAD animations lifted from a movie loaded with digital effects. Or occasionally, Leach will intentionally mar his perfect painted surface with a clumsy brush stroke. In his two unframed works, the thick resin, which gives his paintings their seductive depth and gloss, is allowed to drip over the sides like mini stalactites. By revealing the tricks of his trade, Leach demands that we acknowledge his paintings as objects which have been constructed, not as reflections of some reality. The thing is, I would have drawn this same conclusion about the work without reading the statement. My interpretation may or may not be the point Leach was really trying to make, but in our post-post modern world, in which the author is well and truly dead, (and here I go with the French theory, thank you Roland Barthes!) it doesn’t matter. Art will speak for itself whether the artist wants it to or not! Sam Leach: Present at Hand is on at Sullivan+Strumpf Fine Art until October 24, 2010. My approach is to first view the body of work, letting the art speak for itself, and then to read the artist statement. This way I get to experience the art without influence as well as seeing if I can glean additional information from the artist statement. It’s also interesting to see if my impression matches with the artist’s intention. I attended Sam Leach’s exhibition and thoroughly enjoyed it. My initial interpretation was around evolution and nature-meets-digital. Only when I read his artist statement and then your post did I come to understand his approach of art as object. This knowledge allowed me to appreciate his work on a new level. Thanks for the insight. Keep on posting; I love reading your blog. Ah! Pop goes the weasels! I’m not entirely certain about your claim that the viewer needs no introduction – that the viewer alone & their interpretation or mis(s)-interpretations is the best course to getting into an artwork. I guess we need to start thinking about what sort of artwork you mean. Is a documentary photograph placed in the art gallery context a work of art or a document about an event in time, place and with particular people in view. Are you referring to the mother-load of individual artists – who’s poetic constructions in the name of self-expression line the walls of most commercial galleries in this city. Having that question in my mind, it’s acknowledged that contemporary art has gained a place in the museums and galleries as a matter of course. Pre-1981 that was not the case. 30 years ago people like Bernice Murphy started to break down the conservative mould the institutions and audiences saw modern art in and through. In 1987 I wrote what you probably would call an incomprehensible artist’s statement for my first solo exhibition. I think it was called Transcription Drawings:studio notes. A photocopied foolscap page, placed in a small now-defunct gallery at the lower end of King Street Newtown. Incomprehensibility could also mean difficult to understand. I think it was T S Eliot who wrote about a difference between meaning and understanding in poetry. That both conditions are possible, but that time to immerse yourself in the literary experience is a course the viewer must be able/willing to undertake. Artists statements might point to the meaning of their works, but the fullness of understanding their works might only come in the fullness of time – if at all. In 1987 the abstract forms I assembled in a sequence around the walls of that space were observed mostly by local people and the factory workers passing by. At that time a fine art gallery was a novelty to the people I that area. My difficult works, transcribing music, were serial graphic marks motioning into subsequent panels. It those marks and the filmic quality of series I gave the audience enough of the pattern process and procedure (the evidence) to read the work. There was no need to read the room-sheet, where I’d copied my studio notes as a kind of artists’ statement. The artist Christopher Hanrahan was speaking on a panel at Performance Space a few years ago. He opened the night by saying he loathes the writings many artists place alongside artworks. He said this presented more often as an apology. I love that term. Over the years, my main apologist has been the historian philosopher Paul Carter. On the rare occasions someone critically noticed our engagements, they mangled the meaning, and published their rants using misquoted statements. (Jacques Delaruelle attacked getting the quoted quote wrong). That mistake unfortunately rendered Jacques’ criticisms meaningless. So there you go! That’s because the original document is not actually present in an archive to check. Now in this day and age of digital storage systems, documents however ephemeral are possibly available. In the 80s I collected ephemera for the National Gallery of Australia research library. Often I found a single page room-sheet would be the only record of an exhibition or an event that has remained. The artists, the art works disappearing without trace. The Chief Librarian was most appreciative, and I was paid at a rate of $1.00 per sheet. That collection and small income stream ended for me when a commercial gallery owner made a complaint about me. She said it gave a commercial advantage to other artists she didn’t represent, and it was sound business acumen to block such an advantage! Strange how the insignificant documents have the real perceived value and force. Silencing artists is not the approach I would recommend my colleagues. Sure there is a kind of museolgy creeping into much of the statements artists write. 30 years later art students study at a higher theoretical level and I think that is perhaps reflected in the kind of writing Sam Leach supports the painting with. Or perhaps the stranglehold that the Australian art academy applies on methods and forms of scholarship/practice/commercialisation has itself become conservative. But that is a thing artists might take a long hard look at in the future. That said, I think artists’ need to write their thoughts freely, unencumbered by your sort of prescriptive romanticism. Artists are never silent. It is the conversations and debates behind the scenes that make their work strong. Wow. Thanks for your very in-depth comments!